Understanding the protein’s protective mechanism could help in the development of new antibacterial agents. 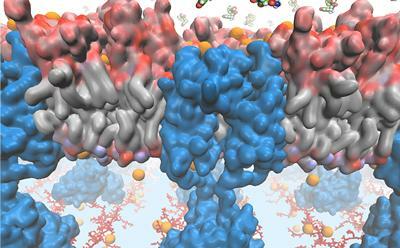 A highly complex cell envelope protects these bacteria from the presence of naturally occurring antimicrobial compounds and conditions that could cause sudden, potentially damaging changes in the cell volume. The envelope is composed of outer and inner membranes, which are separated by a region known as the ‘periplasmic space’. The periplasmic space is composed largely of a molecule called peptidoglycan, which forms an extended ‘mesh’. This is often referred to as the cell wall. Lead author, Professor Syma Khalid, Professor of Computational Biophysics within Chemistry at the University of Southampton, said: “If we are to design novel antibiotics that will either destroy the protective cell envelope of harmful Gram-negative bacteria or gain access to the interior of the cell by crossing the cell envelope, we must first understand how the structure of the cell envelope enables it to carry out its protective functions. Of fundamental importance, is to understand how the cell wall is connected to the inner and outer membranes.